An object attached to belts or strings can spin continuously without becoming tangled. Notice that after the cube completes a 360° rotation, the spiral is reversed from its initial configuration. The belts return to their original configuration after spinning a full 720°. ^ Spinors in three dimensions are points of a line bundle over a conic in the projective plane. In this picture, which is associated to spinors of a three-dimensional pseudo-Euclidean space of signature (1,2), the conic is an ordinary real conic (here the circle), the line bundle is the Möbius bundle, and the spin group is SL2(R). In Euclidean signature, the projective plane, conic and line bundle are over the complex instead, and this picture is just a real slice. ^ Spinors can always be defined over the complex numbers. However, in some signatures there exist real spinors. Details can be found in spin representation. ^ A formal definition of spinors at this level is that the space of spinors is a linear representation of the Lie algebra of infinitesimal rotations of a certain kind. 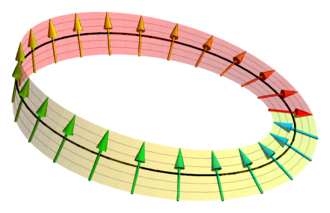 ^ More precisely, it is the fermions of spin-1/2 that are described by spinors, which is true both in the relativistic and non-relativistic theory. The wavefunction of the non-relativistic electron has values in 2 component spinors transforming under three-dimensional infinitesimal rotations. The relativistic Dirac equation for the electron is an equation for 4 component spinors transforming under infinitesimal Lorentz transformations for which a substantially similar theory of spinors exists. ^ Formally, the spin group is the group of relative homotopy classes with fixed endpoints in the rotation group. ^ More formally, the space of spinors can be defined as an (irreducible) representation of the spin group that does not factor through a representation of the rotation group (in general, the connected component of the identity of the orthogonal group). ^ Geometric algebra is a name for the Clifford algebra in an applied setting. ^ The metric signature relevant as well if we are concerned with real spinors. See spin representation. ^ Whether the representation decomposes depends on whether they are regarded as representations of the spin group (or its Lie algebra), in which case it decomposes in even but not odd dimensions, or the Clifford algebra when it is the other way around. Other structures than this decomposition can also exist; precise criteria are covered at spin representation and Clifford algebra. ^ The TNB frame of the ribbon defines a rotation continuously for each value of the arc length parameter. ^ This is the set of 2×2 complex traceless hermitian matrices. corresponding to the two different elements of the spin group that go to the same rotation. ^ Although there are several more intrinsic constructions, the spin representations are not functorial in the quadratic form, so they cannot be built up naturally within the tensor algebra. ^ So the ambiguity in identifying the spinors themselves persists from the point of view of the group theory, and still depends on choices. ^ The Clifford algebra can be given an even/odd grading from the parity of the degree in the gammas, and the spin group and its Lie algebra both lie in the even part. Whether here by "representation" we mean representations of the spin group or the Clifford algebra will affect the determination of their reducibility. Other structures than this splitting can also exist; precise criteria are covered at spin representation and Clifford algebra.
." The star (*) refers to Cartan 1913. ^ Named after Paul Dirac. ^ Named after Hermann Weyl. ^ Named after Ettore Majorana. ^ Graham Farmelo. The Strangest Man: The Hidden Life of Paul Dirac, Quantum Genius, Faber & Faber, 2009, ISBN 978-0-571-22286-5, p. 430. ^ Sauter, F. (1930). "Lösung der Diracschen Gleichungen ohne Spezialisierung der Diracschen Operatoren". Zeitschrift für Physik. 63 (11–12): 803–814. Bibcode:1930ZPhy...63..803S. doi:10.1007/BF01339277. ^ a b Pertti Lounesto: Clifford algebras and spinors, London Mathematical Society Lecture Notes Series 286, Cambridge University Press, Second Edition 2001, DOI 978-0-521-00551-7, p. 148 f. and p. 327 f.
^ Hestenes, D. (1967). "Real spinor fields". J. Math. Phys. 8 (4): 798–808. Bibcode:1967JMP.....8..798H. doi:10.1063/1.1705279. ^ These are the right-handed Weyl spinors in two dimensions. For the left-handed Weyl spinors, the representation is via γ(ϕ) = γϕ. The Majorana spinors are the common underlying real representation for the Weyl representations. ^ Since, for a skew field, the kernel of the representation must be trivial. So inequivalent representations can only arise via an automorphism of the skew-field. In this case, there are a pair of equivalent representations: γ(ϕ) = γϕ, and its quaternionic conjugate γ(ϕ) = ϕγ. ^ The complex spinors are obtained as the representations of the tensor product H ⊗R C = Mat2(C). These are considered in more detail in spinors in three dimensions. ^ This construction is due to Cartan. The treatment here is based on Chevalley (1954). ^ One source for this subsection is Fulton & Harris (1991). ^ Via the even-graded Clifford algebra. ^ Lawson & Michelsohn 1989, Appendix D.
^ Brauer & Weyl 1935.